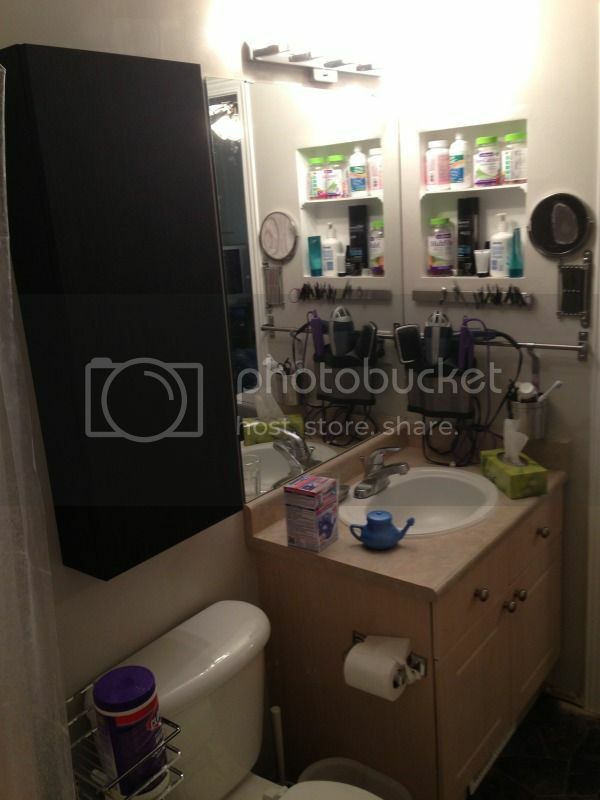 A Base Of Our Own: Bathroom Reno- complete! The bathroom is done the bathroom is done! I LOVE my new bathroom. EVERYTHING fits in it! It stays clean! Because everything fits in it! So as you can see- I painted the walls! No more ugly butter yellow! Not that I have anything against yellow in general- but this yellow had seen better days. The colour on the walls here is Burnished Clay by Behr. It's funny- this colour definitely changes based on it's surroundings. My parents have it in their basement and it looks much more beige. In my bathroom it takes on an almost purple hue- probably because of the blueish floor. I don't really care- it's so much fresher! 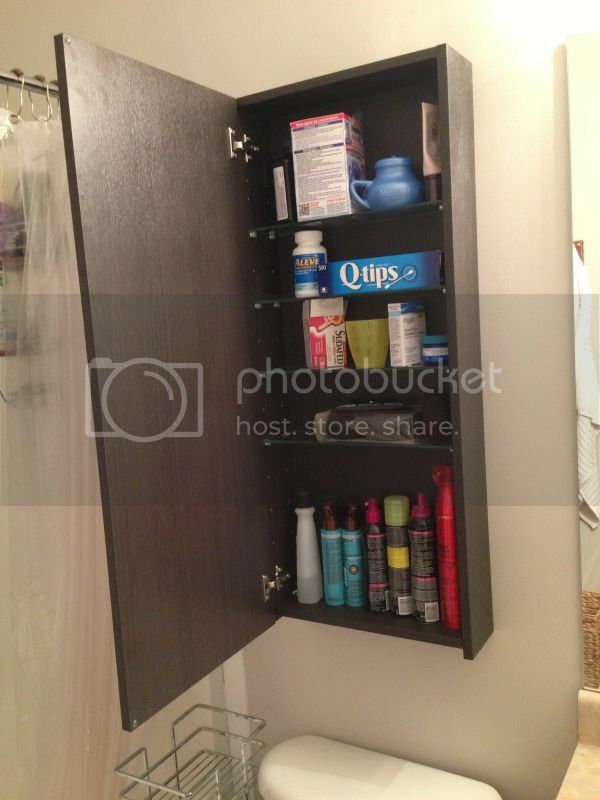 The other big change in that picture: hello human-sized medicine cabinet! That one in particular is the Godmorgen single cabinet from Ikea in brown/black. For the size the price of it simply couldn't be beat- 90$. Once other priorities are taken care of I think I'm going to add a big chrome straight handle to the front to give it some interest, but it's perfectly functional the way it is. LOOK AT ALL THAT STORAGE!! Hair products, netti pot and saline mix, qtips, medicines- all safely ensconced in the cabinet, where they ought to be. This is the view of my vanity now. Excuse the netti pot and tissues- I had a wicked sinus infection and putting them away was just not worth it. However do you notice something? That's all that's on the counter: what I immediately need! Where the ugly medicine cabinet was, and then the hole, I've now got my recessed shelving that I talked about in my previous post that again- holds STUFF! So much stuff. Vitamins and hair products and face cleansers and y'know- stuff I use daily. The rod holds my hairdryer caddy and a cup that holds my toothbrush, toothpaste, and Clairsonic brush. Basically- everything has a spot! Here I'm sitting in my bedroom looking through the pocket door. This was before we got the baseboards in- but they're in now! I found the amazing laundry hamper at HomeSense for 30$ and the hooks above at a store called Wunderkammer in Ottawa (you can't see but they look like deer heads.) 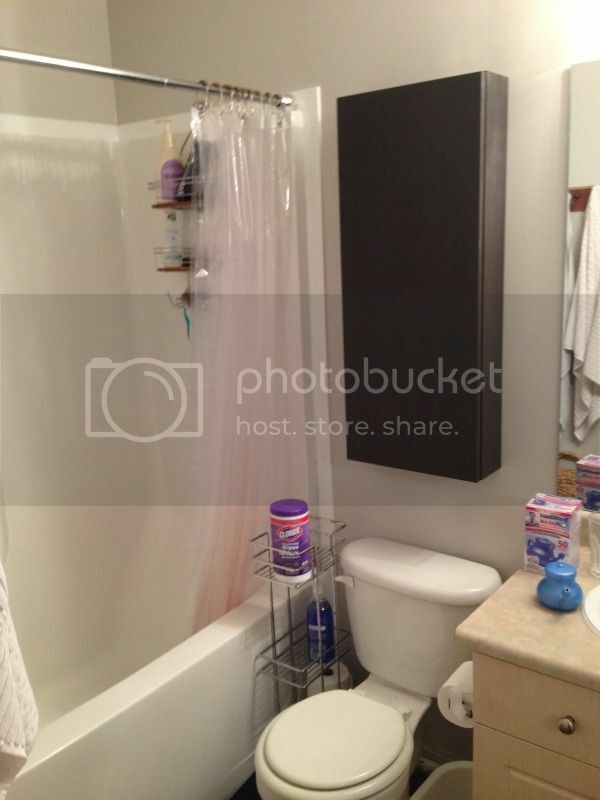 Spot for dirty laundry and towels? Check. Also note our new fancy dual shower head- best thing ever. Above the door I added a shelf from Ikea. These shelves are fantastic because you can cut them to length and the brackets cover the cuts. The shelf is exactly the width of that space. The woven baskets I again got at HomeSense for 7$ each. They hold things that I need to have in the bathroom but that I don't use on a daily- or even monthly- basis. Stuff like extra soap, pads (currently pregnant! ), makeup sponges, etc. The idea was to get some stuff out of the vanity cabinet so it wouldn't become so cluttered that things would get lost in there. It's fantastic! 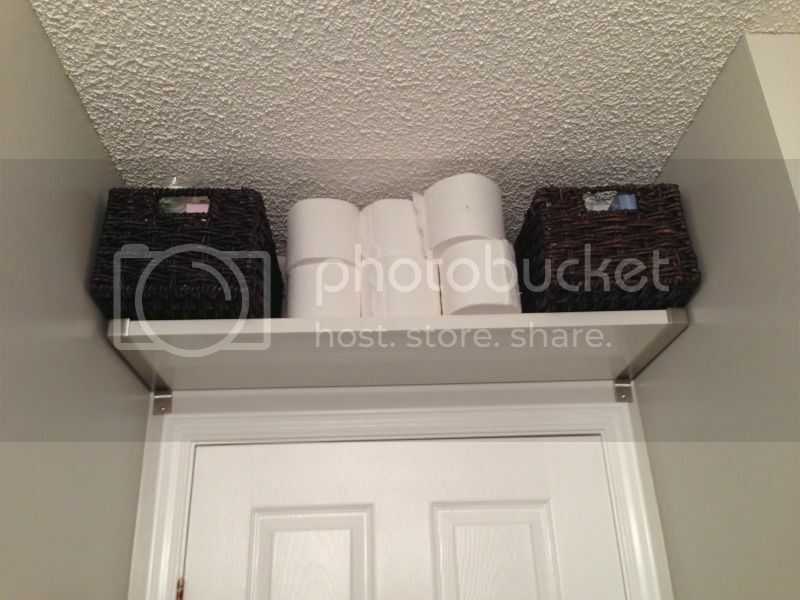 I also clearly keep extra toilet paper up there. There's a small folding step stool that sits in the vanity cabinet so I can get up there when I need to. 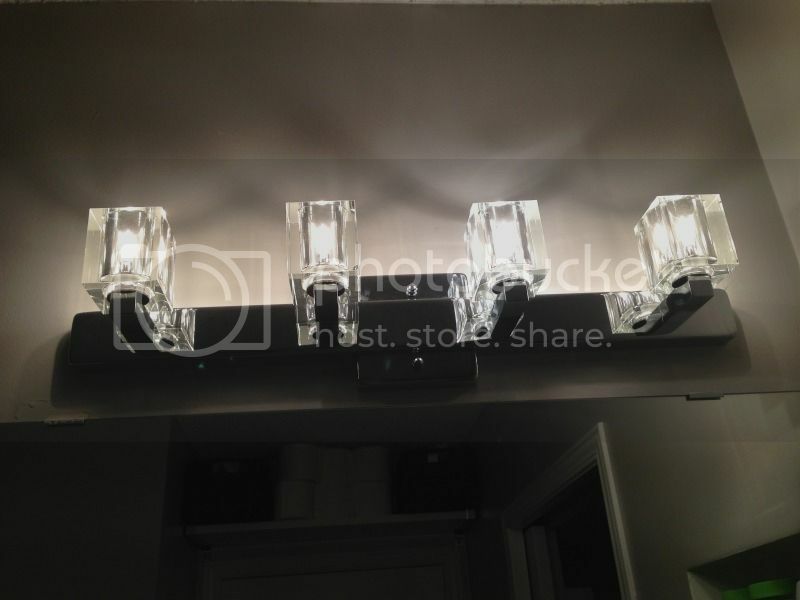 We replaced the ugly seashell fixture. Pretty isn't it? Much more modern and it adds some sparkle to the space. At some point I plan to frame out the mirror, but it's not a pressing need. 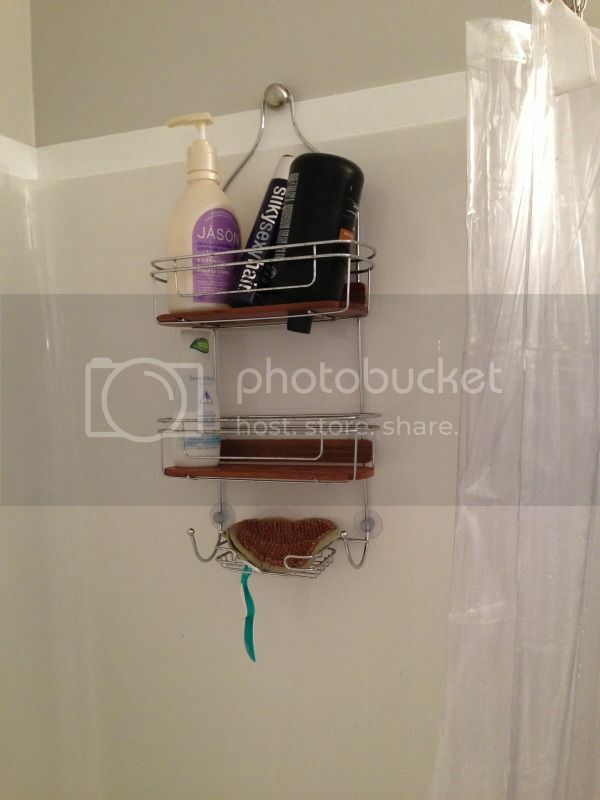 I also added a shower organizer to the back wall. This one is teak and I found it- yeah- at HomeSense. It's hanging on a knob that got ousted from the kitchen, which is screwed into the wall with a hangar bolt. (*I could only find these at Lowes. Bring the knob you want to use cause there's lots of sizes. They're typically used to screw in furniture legs- the associate who helped me had no idea what I was asking for before I told him this.) I find this a lot easier to use than hanging it on the shower head, and it wouldn't fit anyways with our new dual one. It's very steady! 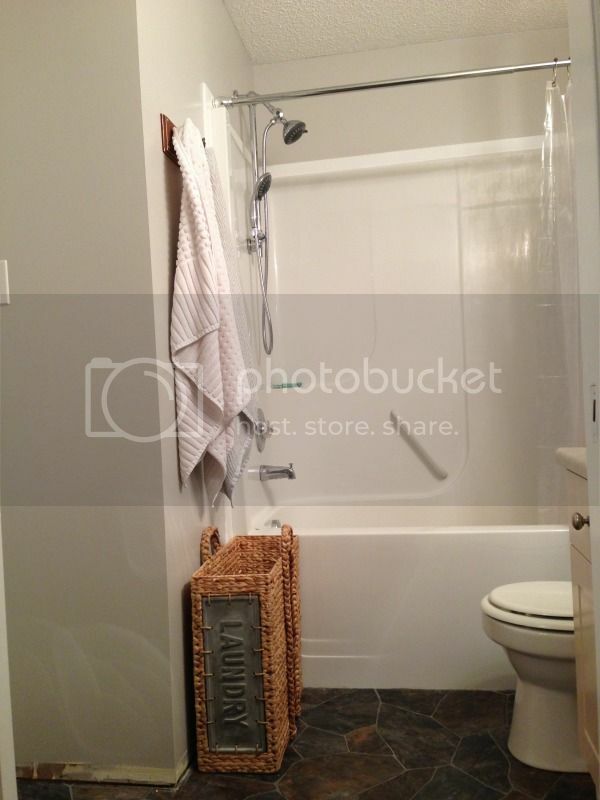 And that my friends is my bathroom refresh! It's just so much more functional now. It FEELS cleaner just because it's less cluttered. And yeah- it's easier to keep clean because it's less cluttered. I now feel like this bathroom is viable to be used by a family of three. There's room for baby boy to come now! It's amazing how just having the RIGHT kind of storage in a small space can take it from completely unusable and stressful to relaxing and functional! Next up I'm going to be posting about our NEW KITCHEN FLOOR! We're re-tiling with TrafficMaster Ceramica 12x24 groutable vinyl tiles...and it's going to look fantastic!